Are you based in North America and are looking for someone with ghostwriting experience to help you with your next writing project? 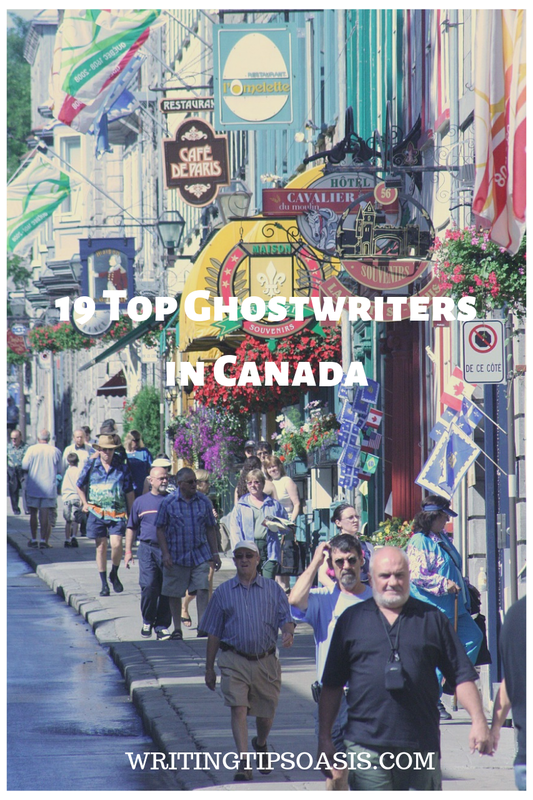 Continue reading to learn about 19 top ghostwriters in Canada. Katie McDonald is a Toronto-based freelance writer and founder of Striking Content. She offers a wide range of writing services, including copywriting, editing and proofreading, website content writing, video scripts, book ghostwriting, and more. Katie graduated with a degree in Marketing and Business Management from the University of Western Ontario and is now a full-time copywriter. She has worked with several major telecommunications companies and has been involved in a wide range of marketing campaigns. She is incredibly passionate about her work and making sure that she perfectly captures your story. If you’re interested in working with Katie, you can contact her via email, through her website’s online contact form, or call 1 (866) 960-9112. Mike Wicks is a ghostwriter, freelance writer, and author based out of the Greater Vancouver area in British Columbia. He is an official member of the Association of Ghostwriters and is a part of the New York Times Bestselling Ghostwriters and Editors team with Kevin Anderson & Associates. Mike offers ghostwriting services for speeches, articles, blog posts, and books and prefers to work on nonfiction topics. He collaborates closely with his clients to capture their voice and the stories they have to tell. Since all projects vary in length, subject matter, genre, and so on, it’s highly recommended that you reach out to Mike to request a project quote. You can do so via email, through his website’s online contact form, or by calling (250) 704-6686. Philip Sherwood is a memoir ghostwriter and founder of lifewriters.ca, a writing company based out of Greater Vancouver that specializes in capturing memoirs, family stories, and corporate histories. Philip has worked with an impressive number of clients to retell their stories, and you can find a comprehensive list of his projects in his online portfolio. His ghostwriting service includes interviews, research, travel time, transcriptions, editing, writing, and revisions, photos and memorabilia, book design, and more. Since all projects differ, you’re strongly encouraged to contact Philip for a project quote. You can do so via email or by calling 1 (800) 864-9152. Liz Green is a freelance ghostwriter and the founder of Green Goose Ghostwriting, based out of Kimberley, British Columbia. Liz loves to work with entrepreneurs and works primarily on self-help guides, big idea books, memoirs, autobiographies, and general non-fiction projects. She offers first step, outlining, and full-service ghostwriting packages over the phone or via Skype. You can schedule a free 30-minute Skype or phone consultation to get a better sense of her ghostwriting services. Alternatively, you can contact her through her website’s online contact form for more information. Sylvia Taylor is an award-winning freelance writer, editor, educator, and communications specialist based out of Metro Vancouver, British Columbia. She offers a wide variety of writing services, including editing, author coaching, and ghostwriting. She has worked on projects like “In the Belly of the Horse” by Eliana Tobia, “Getting Past Anxiety” by Melissa A. Woods, and “No Ordinary Seaman: A Memoir” by Gary H. Karlsen. Having worked on over 120 different projects, Sylvia knows exactly what it takes to write a captivating story in collaboration with her clients. If you’re interested in her ghostwriting services, you can contact Sylvia either via email or call (604) 807-5358 to get started. Julia Aitken is a ghostwriter based out of Prince Edward County, Ontario. She is a well-known freelance food writer and editor, and has several titles published under her own name. Julia has worked with several major publishing companies and specializes in books about food and drink, but also has experience working on décor, architecture, and design projects. If you’re interested in working with Julia on a cookbook project, you can contact her through her website’s online contact form to request more information about her writing availability. David Hayes is an award-winning Toronto-based freelance journalist who has worked with several clients like Saturday Night, Report on Business, The Walrus, The New York Times Magazine, The Globe and Mail, and Toronto Life. He offers ghostwriting services and has worked on projects like “The Zero Dollar Car: How the Revolution in Big Data Will Change Your Life” by John Ellis, and co-wrote books like “Don’t Listen to Everyone With an Opinion: 20 Lessons Over 20 Years of Investing” with Wayne Deans, and “The Passion to Skate: An Intimate View of Figure Skating” with Sandra Bezic. If you’re interested in working with David, you can contact him via email or reach out to his literary agent via email or call (414) 964-3302. Carimé Lane Boehr is a freelance writer based in Toronto, Ontario. She offers article and feature writing, ghostwriting, and technical writing services. She has worked with clients like alive (Canada’s Natural Health and Wellness Magazine), Wellness Matters, OfficePro, PizzaToday, Sherman’s Travel, Canadian Immigration, and The Peak. She is currently accepting new clients and projects at this time. If you’re interested in working with Carimé, you can contact her directly via email for more information about her ghostwriting services. Penelope Jackson is a freelance editor and writer based out of Halifax, Nova Scotia. She offers a wide range of services, including editing, proofreading, manuscript critiques, and book ghostwriting. Whether you’re looking to write fiction or nonfiction, Penelope can definitely help you put words to the page! She has worked with authors like George Elliott Clarke, Kate Inglis, and Lesley Crewe. If you’re interested in Penelope’s ghostwriting service, you can contact her through her website’s online contact form to request a project quote and more information. She is also happy to set up a Skype or Facetime appointment to discuss your writing needs. Carolyne Regan is a freelance writer based out of Windsor, Ontario. She offers a wide range of services geared toward business writing, editing, blog and speech writing, web copy, and book writing. She has a great deal of experience working with businesses and has homed in on her technical clarity for nonfiction projects. She especially loves to work on cookbooks, self-help books, instruction manuals, anthologies and collections, guides, biographies, reference material, and travel books. For more information or to request a free project quote, you can contact Carolyne via email to get started. Suzanne Boles is a freelance writer and writing coach based out of Ontario. Suzanne is an official member of the Professional Writers Association of Canada and the American Society of Journalists & Authors. She has worked with a wide range of clients like Reader’s Digest, Maclean’s, The Globe and Mail, Business London, Chef Connexion, and Headspace. You can browse through her online portfolio to get a better sense of her work and the projects that she’s completed. If you’re interested in her writing services, you can contact her via email or call (519) 680-3497 for more information or to request a free project quote. Stephanie Krikorian is an award-winning journalist, New York Times bestselling celebrity ghostwriter, and an Emmy-nominated reality show creator and executive producer. She offers several different services, including ghostwriting, book doctoring, book collaborations, book proposal creators, journalist/feature writing, editorial services, copywriting and editing, and even offers hourly consultations and brand development. When it comes to ghostwriting, Stephanie prefers to work on projects of health and wellness, female empowerment, personal finance and business, memoirs, lifestyle and food, and pop culture books. If you’re interested in working with Stephanie, you can contact her directly via email for more information and to request a free project quote. Sandra Jean-Louis is a freelance writer and founder of BookGhostwriter.ca, a company based out of Toronto, Ontario. Her ghostwriting services offer dictation and transcription of original concepts, manuscript revisions based on client requests, and manuscript production. She specializes in ghostwriting memoirs, and the entire process can take anywhere between six to ten months. For general nonfiction projects, her rates range between $35k to $50k USD, and her rates for memoirs range between $40k to $55k USD. If you’re interested in working with Sandra, you can contact her through her website’s online contact form to get started on your writing journey together. Fred Langan is a professional writer and ghostwriter based out of Toronto, Ontario. Over the last couple of years, he’s co-written books like “The Survivor – A Life Story” with George Lengvari, “Business and Retirement Guide to Belize” with Bob Dhillon, and “A Lift to Life” with Louis Aldrovandi. Fred has experience working with companies like the Daily Telegraph, National Post, and The Globe and Mail. Fred is currently accepting new ghostwriting projects. If you’re interested in working with him, you can contact him via email, through his website’s online contact form or call (416) 807-5675 for more information or to request a project quote. Marvin Ross is a freelance nonfiction ghostwriter based out of Hamilton, Ontario. He has over 30 years of experience and has written 12 books published under his own name. He has worked for publications and websites like The Globe and mail, The Toronto Star, and The Medical Post. He has worked on projects like “Peril: From Jackboots to Jack Benny” by Pearl Goodman, “What A Life Can Be: One Therapist’s Take on Schizo-Affective Disorder,” by Carolyn Dobbins, PhD, and “After Her Brain Broke” by Susan Inman. If you’re interested in working with Marvin, you can contact him for a free project quote through his Reedsy profile. Sherry Conly is a freelance writer and journalist based out of Nanaimo, British Columbia. She has experience as a copywriter and ghostwriter and has worked with clients like Boulevard Central Island Magazine, Inspired Senior Living Magazine and a boutique real estate firm. Whether you need an article, blog post, website copy, or book written, Sherry is definitely up to the task. You can browse through her online portfolio to get a better sense of her writing style and capabilities. If you’re interested in working with Sherry, you can contact her via email or call (250) 668-6631. Donna Barker is the founder of Author Igniter. Based out of Squamish, British Columbia, Donna is a published author and career technical ghostwriter and writing coach. She specializes in technical copy and has been a contributor for publications like Shared Vision and Vancouver Foundation Magazine. With over 25 years of experience as a ghostwriter, Donna definitely knows what it takes to create engaging content that your readers will find both engaging and informative. You can schedule a 20-minute consultation with Donna on her website to discuss your writing needs. Alternatively, you can contact her through her websites’ online contact form, via email, or call (604) 505-2758. Rachel Dunstan Muller is an author, personal historian, and ghostwriter based out of Ladysmith, British Columbia. She has published several books like “The Solstice Cup” and “When the Curtain Rises.” Rachel is also a storyteller and workshop organizer who loves to help authors find their creative voices and guide them through their writing journey. If you’re interested in her ghostwriting services, you can contact Rachel via email for more information and request a free project quote. Depending on her availability, she may be able to work with you on your ghostwriting project. Melody S. Wright is a professional copywriter and ghostwriter based out of Nanaimo, British Columbia. She has over 25 years of writing experience and can help with ebook ghostwriting, proofreading, copywriting, website content, blog posts, white papers, and more. She prefers to work on nonfiction projects like product user manuals, staff manuals, fact sheets, how-to guides, articles, lesson plans, and policies and procedures, but she’s also more than happy to discuss with you your nonfiction book writing needs. She charges an hourly rate of $30 USD per hour, but depending on your project, it’s strongly recommended that you reach out to Melody to discuss a project quote. You can do so through her website’s online contact form. Are there any other ghostwriters in Canada that need to be on this list? Please tell us about them in the comments box below!